take a look at this greatness i found on flickr. 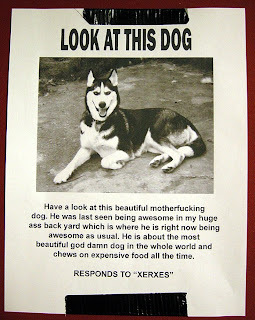 someone plastered a whole neighborhood with good PR for their dog. and it wasn't sherrie partin. looks like doug's mommy needs to try harder to spread the gospel of his awesomeness. click on the poster to enlarge for your viewing pleasure. The house is very quiet this morning without my little noisemakers scampering around. The "because I'm bigger" method of attack isn't going to work much longer. But for the time being, it's pretty effective. Happy Would-Be Birthday, Old Friend. 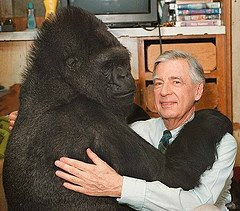 Even Koko loved good old Fred Rogers. For always encouraging children to make the most of this beautiful day, Mr. Rogers---I thank you. I am so happy that my boys think you're great. who's afraid of the big bad owl? about a month or so ago, angus had a nightmare about an owl. he woke up drenched in sweat and screaming sometime around 2AM. from what i've been able to gather in our many many discussions about owls since that night, the dream involved an owl sneaking into his school and flying around the room, tormenting angus by staring at my terror stricken boy and blinking his eyes wildly and flapping his wings up and down. which is actually a pretty terrifying thought. i'm sure he'd had nightmares before this one, but the owl dream was the first dream he was ever able to articulate as a bad dream, and was able to describe what it was about. that night, through tears and in a panicked whisper, he told me the basics: "momma, i had a bad dream! a big scary owl in my school!" poor little buddy. holding him tightly and wiping away his tears, i carried him into my bed and laid him down in that magical safe spot of childhood that exists in the warm space between two slumbering parents. since that night, little man has had a gigantic fear of owls. we had to cease our regular trips to a nearby nature center because of the owl's presence in a certain dark side-room. i had to edit many of our favorite read-aloud books for content-- pages containing owls were quickly passed over to spare my otherwise brave son's nerves. and most of all, he wouldn't even look at those decoys people put up on rooftops to scare away critters. it was honestly heartbreaking to witness the development of a phobia. but today, my brave little munchkin decided it was time to face his fears and spent 20 brave minutes observing owls at the nature center. he first demanded i hold him and then clung to me and hid his face in my neck. then he slowly loosened his grip, slid down from his perch on my hip and lingered in the doorway to the darkened owl habitat. within a few minutes, he was standing right up against the sheet of glass separating him from a large one-eyed great horned owl and a much smaller screech owl. my baby studied the larger and scarier beast's face for the longest time. and then just like that, out of angus' mouth came the sweetest little sound ever. "owls aren't bad, momma. owl's not scary. they're nice. and cute. look! it's a momma and a baby momma!"